CfR is helping communities and renewable energy companies work together to develop and deliver shared ownership models for MW-scale solar and wind projects. 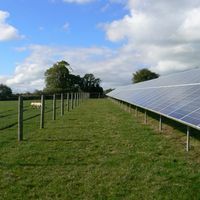 This is one of our 'Split-FIT' solar PV farms, planned near Gawcott in Buckinghamshire. Profits from the community scheme will go to local groups. The funds will go towards addressing fuel poverty, supporting energy efficiency and further community energy initiatives, as well as providing funding for local community organisations. We will soon be releasing the community share offer, please visit our website to register your interest.